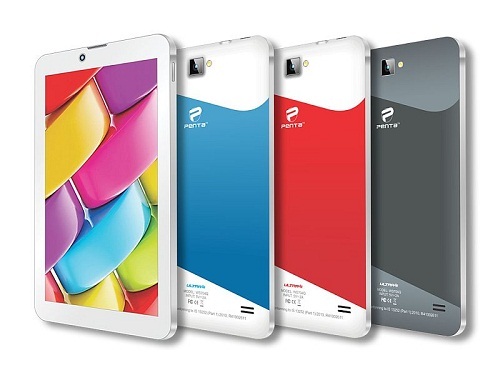 Pantel Technologies has launched their first 4G tablet dubbed Penta T-Pad 704Q4G Ultra 4G. It has been exclusively launched with HomeShop 18. As 4G technology has been launched in India. More and more tab are releasing with 4G feature. Highlight features of this tablet is its price i.e. just only Rs. 6999, Dual Sim support with 4G LTE connectivity on one sim while the other supporting 3G / 2G. Specification features 7-inch IPS display with pixel resolution of 1024 * 600. Tablet rolls out-of-the-box running Android Lollipop v5.1. It has been powered by Quadcore processor clocked at 1.3 GHz coupled with 1 GB of RAM. Tablet has been backed by 8 GB inbuilt storage which can be expanded via. microSD card upto 32 GB. Connectivity includes dual SIM support, Voice Calling, 4G LTE, Wi-Fi, Bluetooth, OTG and microUSB. Tablet has got camera at both sides i.e. 8 MP rear cameras with fixed LED flash and 5 MP cameras at front. Tablet has been backed by 3000 mAh battery which is rated to deliver 6 hours of video playback and 158 hours support in standby mode. Swipe Ace strike is only other tablet below Rs 10,000 that come with 4G. Some of the features of Swipe Ace Strike are Dual SIM Slots, Voice Calling, 4G LTE, 2 GB RAM and 5 MP rear cameras. Battery is of 4000 mah and cost Rs. 6999 only.